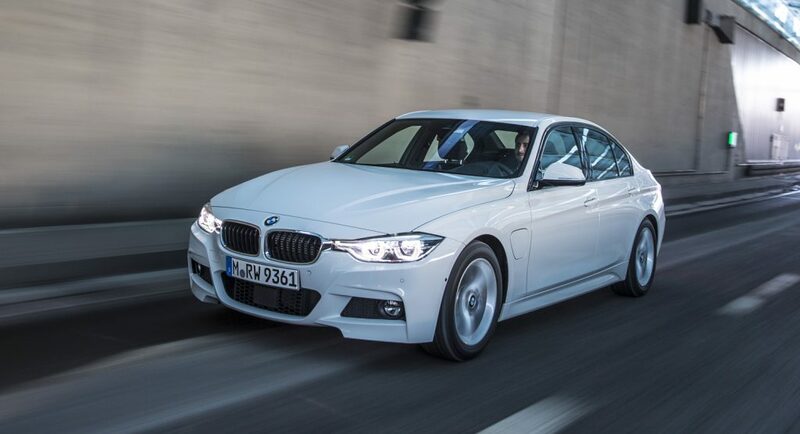 The BMW 330e makes being green fun again! Bavarian Motor Works’ sportiest sedan series dates back to 1975, with the BMW 3-series. Back then you were limited to a carbureted inline 4-cylinder motor producing 74 horsepower or an inline 6-cylinder producing 141 horsepower. They were not rocket ships, even for 70’s standards, but fans quickly adored the 3-series’ suburb weight distribution and excellent handling. The BMW M550i Takes The Cake! 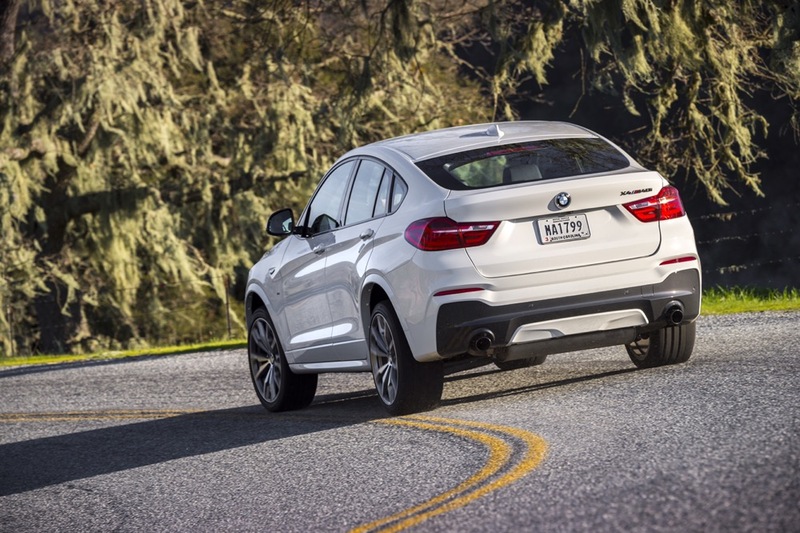 I am sure you have heard of the phrase “you can’t have your cake and eat it too.” This proverb has been accurate for most of BMW’s recent history. This is especially true for their current lineup because their vehicles tend to be polar opposites. 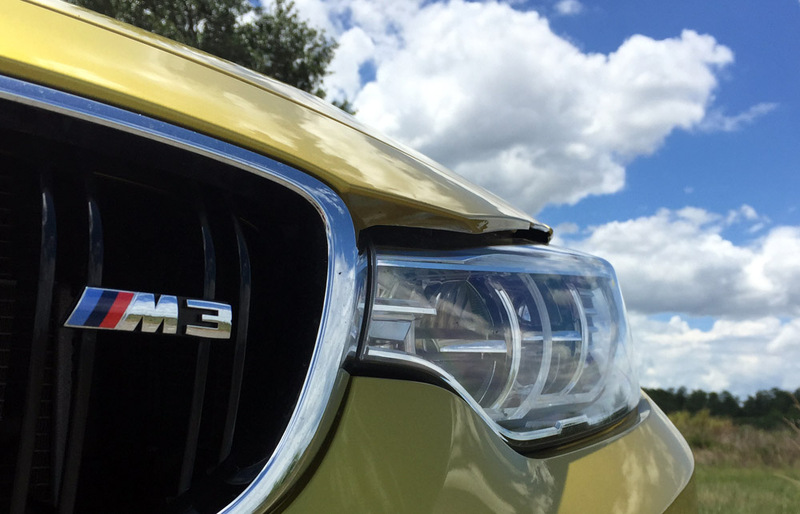 The latest generation of Bimmers offer either Mercedes level luxury or Porsche level performance. 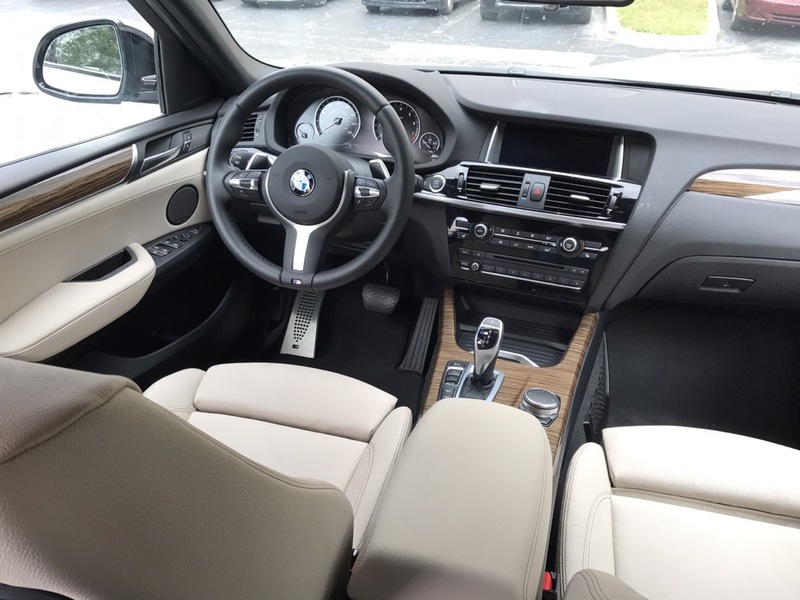 You are either riding in comfort and style in their series models (IE 3-series,5-series,etc) or being bounced around like ping pong ball while you are grinning from ear to ear in their M cars (IE M3,M5,etc). If you haven’t noticed, BMW’s latest trend is to offer “M Sport” packages for their series models; Allowing a 180 horsepower 320i sedan to pose as a 425 horsepower M3. This is like allowing a sheep to dress in wolf’s clothing. The “M Sport” packages in most cases don’t offer any performance benefits while making the vehicle look like an M car. Thus the packages are a waste of money in my opinion. Fall is coming to South Florida; that means 75 degree weather with partly cloudy skies. BMW has created the perfect car for cruising while basking in the warm sunshine, the BMW 650i Convertible. The car offers full size luxury in the form of a droptop that goes up and down in 19 seconds. The driver focused interior on the BMW 650i Convertible has been enhanced (versus previous generations) with even more leather and more wood. The model I tested was fitted with beautiful nappa leather and dark red sycamore wood. 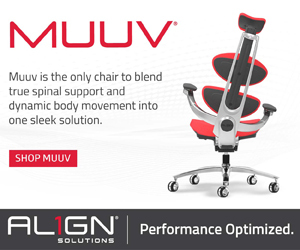 The seats are adjustable in 20 different ways, which includes an adjustable upper back support and seat extender. Heated seats are standard, ventilated front seats are optional. While the front seats are definitly the center of attention, the backseats are not forgotten. The backseats are big enough for both kids and adults to ride comfortably. Driving the BMW 650i Convertible is an enjoyable experience with both the top up or down. 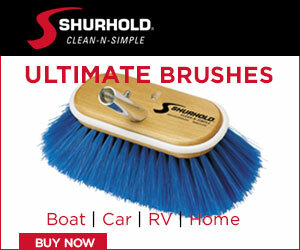 Heavy sound proofing around the car and on the canvas top, deliver a quite ride even at highway speeds. 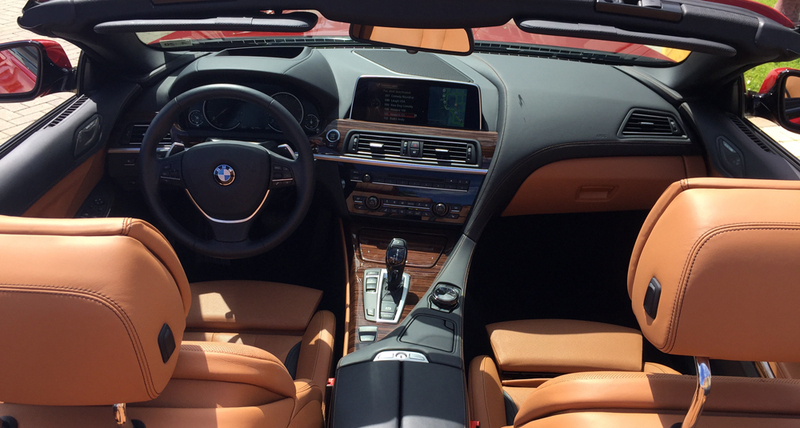 The BMW 650i Convertible blends technology and traditional luxury very well. 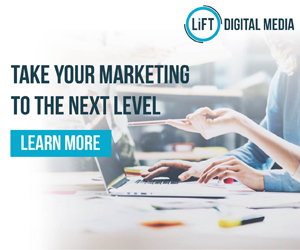 A mid-sized display is accompanied by physical elements to enhance the driving experience and prevent distractions. It displays, telephone, navigation, phone and vehicle information such as your speedometer and tachometer. A gigantic split screen display sits on the top of the center console. This screen allows you to display both the radio and navigation at the same time; while it may not seem important, it is a very convenient feature. As an available option, the 650i Convertible offer a heads up display. The BMW 650i Convertible is one of the heaviest cars in its segment, but at the heart of the BMW 650i Convertible is a twin-turbo V8 engine that produces 445 horsepower and 480 pounds of torque. It launches the car from zero to sixty in under 4.5 seconds. The BMW 650i Convertible’s comfortable ride, beautiful interior, and powerful engine make it a great choice for those who want a luxurious daily driver. Contact your local BMW dealer for more information. The BMW M3 is a powerhouse! The 2015 BMW M3 is a compact luxury on steroids; every thing gets enhanced over the 3-Series: A more powerful engine with nearly 250 more horsepower, bigger brakes, stiffer suspension, and a louder exhaust. One thing you will also notice right away, is that the new BMW M3 is a sedan. Traditionally (prior to 2014) the M3 was a four passenger coupe. 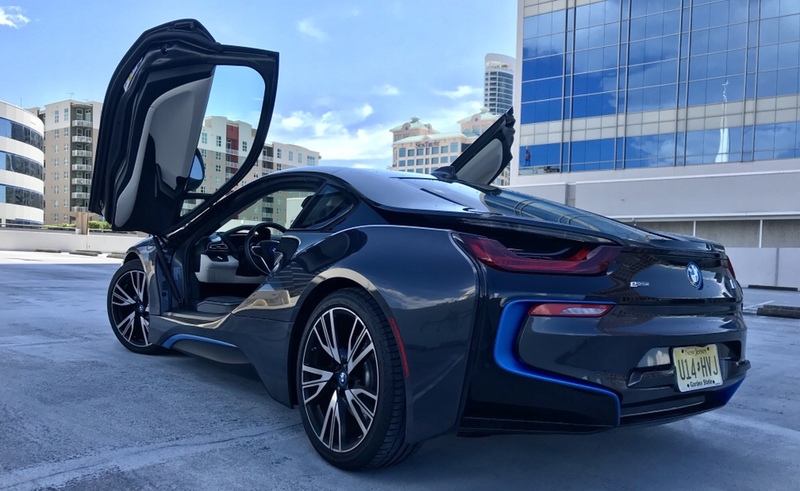 In 2014 BMW transitioned its model system: Odd numbers are sedans / wagons and even numbers are coupes / convertibles (both two-doors and four-doors). 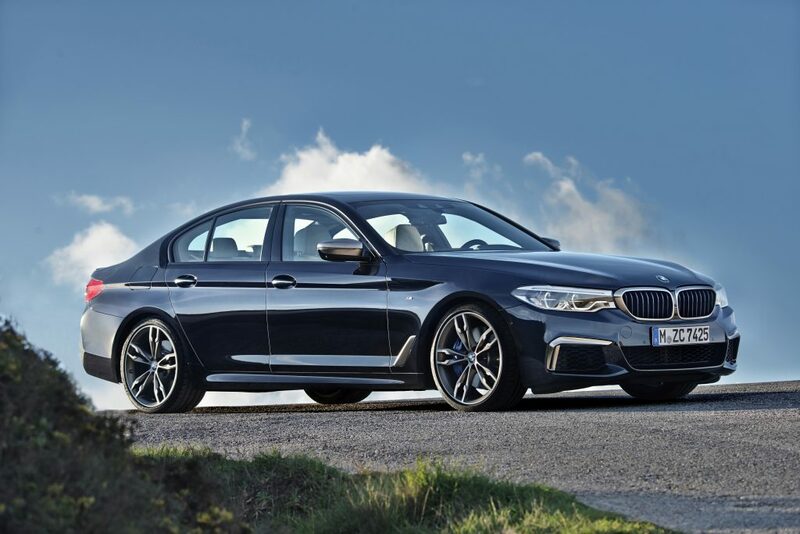 Adding M performance to the new 3-series sedan was a really smart decision. It offers buyers who want a true sports car, but need a backseat and four doors. The only other four door sports car that comes to mind is the Porsche Panamera, but its longer wheelbase and weight means that it wouldn’t be as agile as the M3 on the racetrack. Under the hood of the 2015 BMW M3 is twin-turbo 3.0-liter inline-six that makes 425 hp and 406 lb-ft of torque. It is also an update over the previous generation. Prior M3s offered a 4.0L V8 that produced 414 hp and 295 lb-ft of torque. This new six-cylinder may be smaller, but it is a lot faster! 2015 BMW M3 goes 0 to 60 in just 3.9 seconds. That is faster than the current Audi R8, Porsche 911 and Alfa Romeo 4C. But lets not forget, this is a four-passenger with four doors. 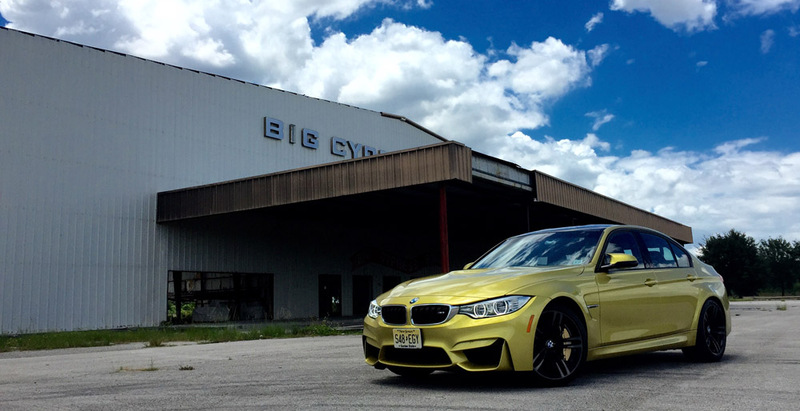 The 2015 BMW M3 I tested had all of the performance bells and whistles, including BMW’s M Carbon-Ceramic Brakes. The package improves brake performance under high temperatures and reduces the overall vehicle weight by 42 pounds; it’s exactly what you need for the racetrack. 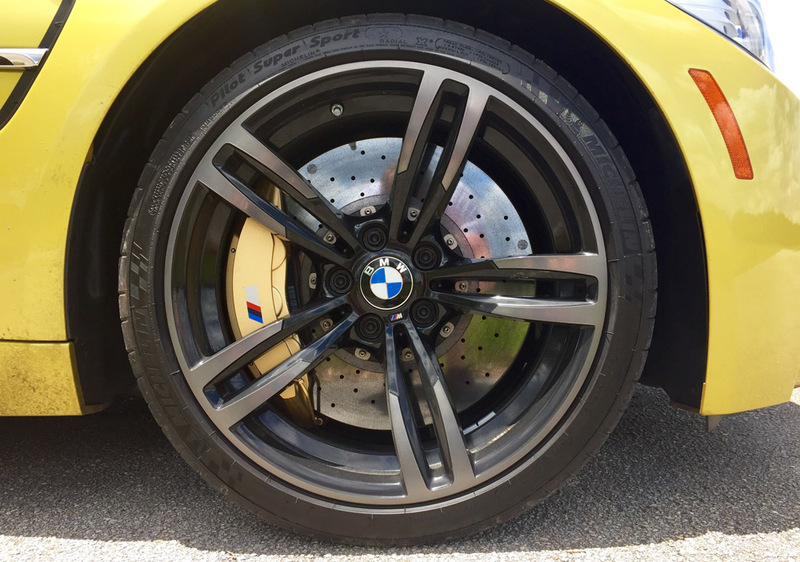 The M3 with the M Carbon-Ceramic Brakes package delivers incredible stopping power when it is dry – it is the quickest stopping vehicle I have ever driven – but be really careful in the rain. On the fifth day of testing the M3, a nice rain shower came through town and I quickly realized that stopping performance went from amazing to poor. It wasn’t the tires, the rain had cooled the rotors and pads, which reduced the effectiveness of the brakes. It also caused them to squeal often… but as soon as the rain passed, the brakes went back to normal and delivered impressive performance. “Life is too short to drive boring cars.” I don’t remember who said it, but they were right. 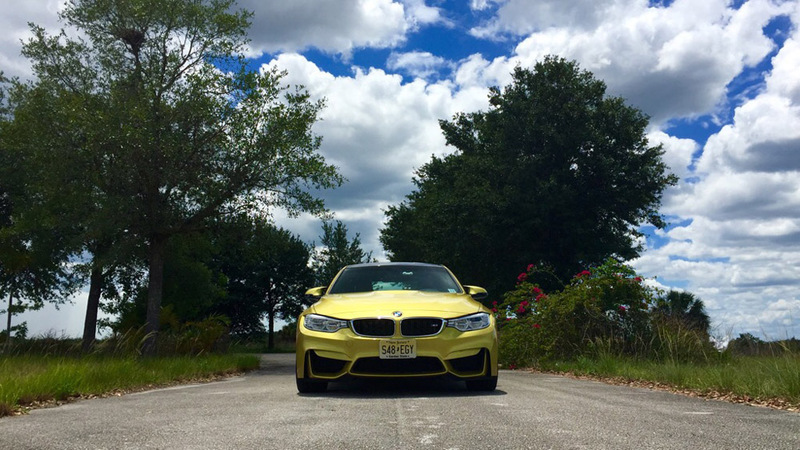 The joy of driving the 2015 BMW M3 is enhanced if you get the 6-speed manual – In my opinion, it is one of the best modern day manual transmissions you can buy. The gearbox shifts easily and the clutch is stiff enough so you easily know when it catches, but not so stiff that it wears your foot out. The best part of BMW’s new manual transmission is active rev-matching. No more heal-to-toe downshifting! As soon as you place the car into gear, the RPMs will rise to the appropriate speed. So all you have to do is let the clutch out. 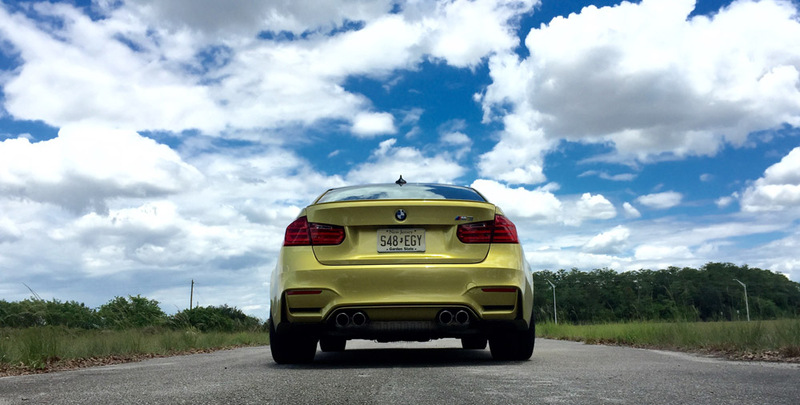 It was really hard to say good bye to the 2015 BMW M3. It was fun to drive, super quick, very nimble, and it comfortably fit myself and three friends… It is the perfect four-door sports car. For more information on the 2015 BMW M3, contact your local dealer or click here to visit BMW’s website.